The Northern Right Whale Dolphin is a small, slender aquatic mammal that is found in the Pacific Ocean. It was first described scientifically by Titian Peale in 1848. This animal travels in pods of up to 2000 individuals with other cetaceans within the deep oceans of the Pacific. 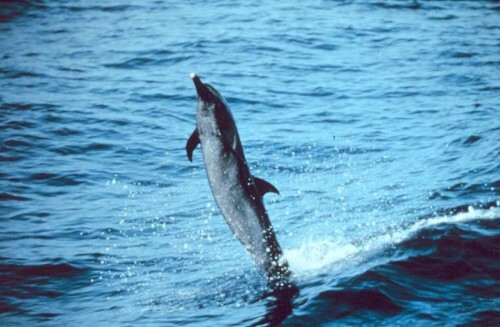 It is one of 2 Right Whale Dolphin species, with the other being found in the southern hemisphere. They can be found in temperate to cold waters of between 24 – 8 degrees Celsius, and latitudes of 51°N to 35°N. Northern Right Whale Dolphins have a streamlined body and a sloping forehead. They do not have any ridges or fins on their backs which are smooth and curved. They have a short and well-defined beak, a straight mouth, and a white patch on its chin. They have small, narrow, curved, and pointed flippers. Their body is mostly black but their underside is white or at least lighter. Adult Northern Right Whale Dolphins weigh approximately 60 to 100 kilograms. They have between 74 – 108 teeth but they are not externally visible. As calves, they are cream or greyish brown in colour. They will stay like this for a year until their body mainly turns black. Adults are at least 2 metres long. Some males are 3.1 metres long, whilst some females are around 2.3 – 2.6 metres long. Other than that, they look almost the same. Newborn Northern Right Whale Dolphins are smaller at only 90 cm. As mentioned above, they travel in pods of up to 2000. 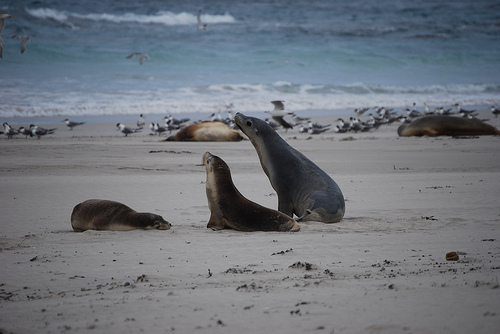 However, groups are usually between 5 to 200 individuals. When they travel fast, the group looks almost as if they are bouncing along the water as they will make low leaps together. Some leaps can be as far as 7 metres per leap. They are graceful and shy animals which avoid boats. They are bow riders at times, and can often be seen doing acrobatics such as belly-flopping, side slapping, breaching, and lobtailing. Don’t let this animal fool you as it is a predator. It travels at speeds of up to 30 to 40 km per hour in the open ocean, but they do not travel this fast along coastlines especially if they are shallow. They can dive up to 200 metres to search for food such as squid and lanternfish. Unfortunately during the 18th century, the Northern Right Whale Dolphin was targeted by the whaling industry for food. 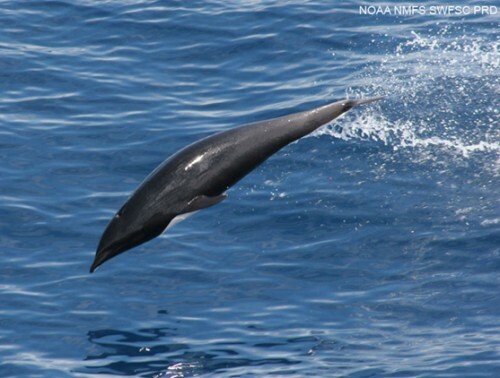 During the late 20th century, Northern Right Whale Dolphins were caught in drift nets which are used for squid fishing on a large scale. By using this technique, it is thought that the population of the Northern Right Whale Dolphin decreased by 1 to 3 quarters. The current population of this animal is currently unknown, but the IUCN Red List classifies the conservation status of this animal as being of Least Concern.